On Sunday, NOAA’s Storm Prediction Center released updated 2012 tornado statistics. While these are not official statistics just yet, the report from SPC provides insight about the number and strength of tornadoes last year. SPC reports there were 936 confirmed tornadoes in 2012. This fell well short of the record of 1,817 confirmed tornado in 2004 but was still enough to get the 25th spot on the list of years with the most tornadoes. Statistics also reveal that the number of people killed by tornadoes in 2012 nationally was below average. 68 people were killed by tornadoes in 2012; on average, 91 people are killed by tornadoes each year. While these statistics may lead to you believe 2012 was a quieter-than-average year for tornadoes in the United States overall, it was a record-setting year locally. While the 16 confirmed tornadoes in the Tri-State is less than 2% of 936 confirmed tornadoes nationally last year, 16 confirmed tornadoes in the Tri-State is still a yearly record. Of only 4 confirmed violent (EF-4 and EF-5) tornadoes in the United last year, 1 occurred here in the Tri-State, striking Piner and Crittenden. 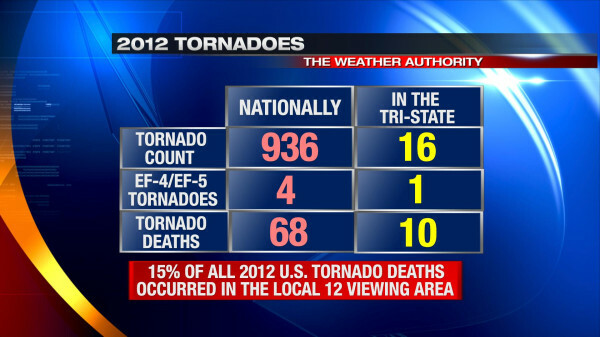 The most alarming statistic coming from the SPC’s report is that 10 of the 68 people that died from tornadoes in 2012 unfortunately died here in the Tri-State. In other words, 15% of all tornado-related deaths in country last year occurred too close to home. All of those local deaths can be blamed on the March 2nd tornadoes. 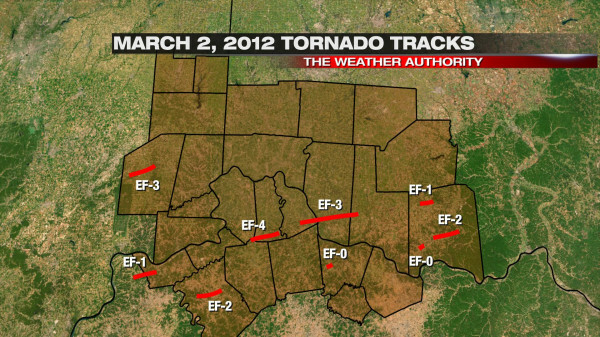 The map above shows all of the tornadoes in the Tri-State on March 2, 2012. March 2 was one of the biggest tornado outbreaks the Tri-State has ever seen, but not all tornadoes were not long-track and violent. One of the the devils in the details is the fact that 50% of all tornado-related deaths in the Tri-State on March 2nd occurred in mobile homes. To read the “United States Tornadoes Of 2012” fact sheet from SPC, click here.